Skirts constitute an essential part of our closet. Whatever season it is, we tend to resort to this article of clothing, as it helps us create some of the most astonishing and wonderful ensembles ever. Good thing there are so many options one can go for – from a super mini skirt to a flare maxi one. 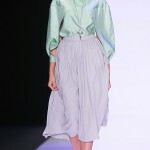 Today you will have a chance to check out the most awesome pleated skirts that one can wear this spring. Read on and choose the one that would fit into your wardrobe the best! If you want to stick to a classic color palette of the season as well as be in line with the latest trends, then this awesome outfit in white and pink is exactly what you need. The beautiful pleated midi skirt features the hottest shade of Spring 2015 – strawberrypink. It is absolutely pointless to describe all the advantages of this color, as one can get everything from one single glance at the image. The saucy design is paired with a very plain yet super stylish tank crop top in white as well as bright pumps in yellow. In case you would like to go for something more unique and exquisite, then this look will definitely speak to you a lot. The ensemble is styled with some ethnic motifs – which would be an additional benefit for you. On top of that, it is the color composition that deserves the most attention here. Delicate mint and elegant black create a perfect match, worth of dying for. The short flare pleated skirt featuring both colors is combined with an oversized sweatshirt with an appealing print. The best way to finish this stylish number is to add a pair of embellished gladiator sandals in black and gold. You can also create incredibly sophisticated outfits with the help of such a skirt. And here is one good example for you to follow. This glossy black pleated skirt with a high waist fit and below-the-knee length looks very chic and luxurious. When it is combined with a glowing long-sleeved blazer in gold and a classic collared shirt in sky blue, it becomes absolutely impossible to resist its overwhelming power. In this particular case, the outfit also features a bustier top in tan – however, this is a rather optional piece. If your goal is to impress everyone with your impeccable grace, then you ought to opt for this splendid look. The high waist floor length pleated skirt in white perfectly goes with the matching bustier top as well as the textured crop jacket in cream and gray. A pair of plain white sandals is the most appropriate way to complete such a look. This is that kind of outfit that does not require any additional embellishment or styling, as it is already quite sufficient. You can easily rock it while roaming around the city or else as you attend some fashionable event; both ways you will create the right kind of impression. You can also add some colors to your spring closet and go for this adorable outfit by Chanel. 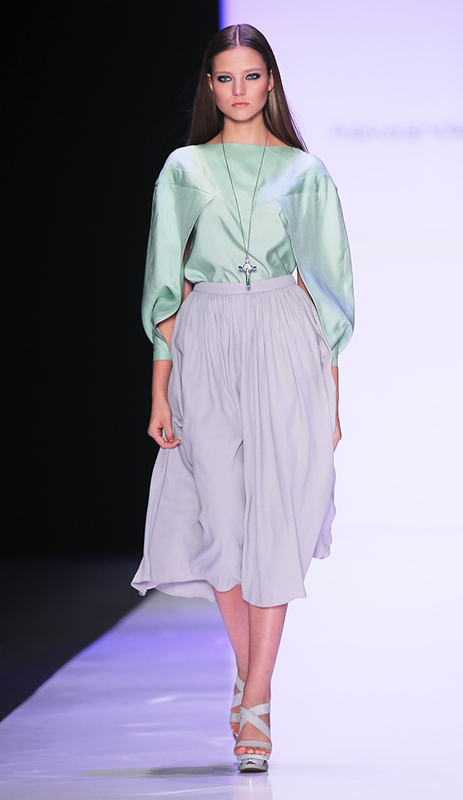 The high waist pleated skirt features two types of texture – the combination that creates an unbeatable impression. The top part in yellow is completely offset by the flare bottom in compelling organza. 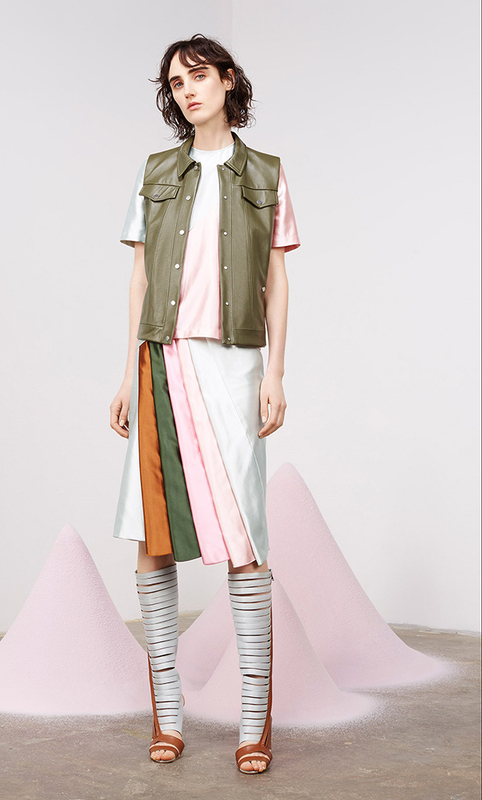 The black, red, green, pink and gray stripes along the skirt somehow match the embellished colorful boots. The strapless crop top in matching yellow draws even more attention to the outfit and makes it totally impossible to resist it. Spring is the time to go for all sorts of prints – and the more unique the pattern is, the more astonishing the outfit looks. Here is a perfect example of how one piece can combine several trends: I am pretty sure you will fall in love with this adorable skirt. The engaging print in black, gray and orange is set against the crystal white surface of the skirt, whereas the pleated design as well as high waist fit make it a very appealing item. One can complement it with anything from a classic collared shirt in a contrasting shade and some plain flats to a rock tee and a pair of high heels. Either way, your outfit will stand out from the range of all the other ones and will by all means make your day. If you are still not compelled, there are some more of the saucy designs below. 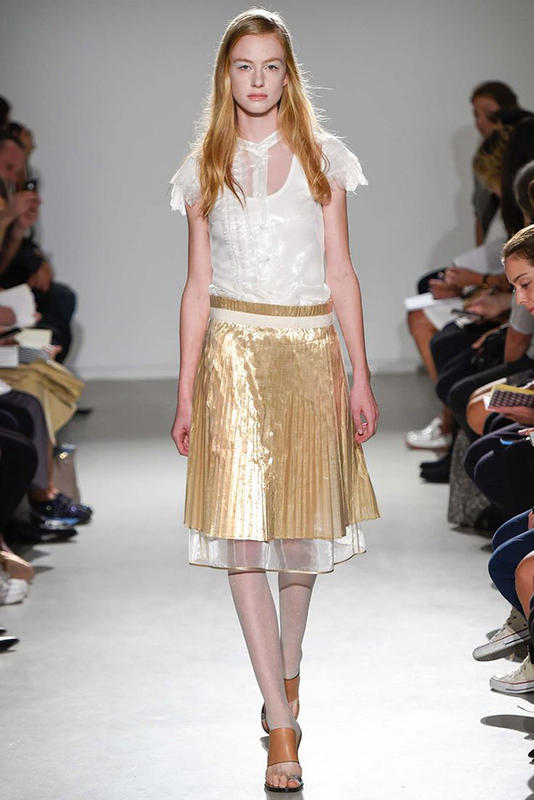 Browse through the gallery and make up your mind on the pleated skirt of your dream.